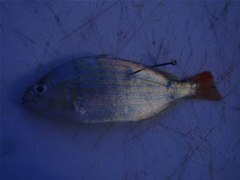 Pinfish can be rigged many different ways depending on the location you are fishing and the type of presentation you want your bait to have. 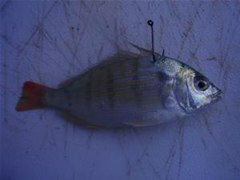 Inserting the hook more towards the head (like the picture to the left) will keep the pinfish closer to the surface. Pinfish will naturally try to swim straight to the bottom because that is where they live in their natural habitat. Putting the hook more towards the tail (like this picture) will allow the pinfish to swim down deeper. Be careful if grass or any other structure is around because the pinfish will be sure to hide in it, many times resulting in a hang up.